While it may feel like our outfits have to be as somber as the temperature outside, that’s hardly the case. Instead of letting the cold get you down, we’ve got a few tricks that’ll rejuvenate your wardrobe and help brighten up dreary days, too. Ahead, our expert stylist Beatrice shares how to stay warm, look cool, and keep the excitement for winter alive. Knee-length coats are great because they can be worn with casual denim, evening wear, and everything else in between. Neutrals are standard this time of year, so to infuse excitement into your outfit, go for a pop of color instead. “It’s a fun way to add a playful touch to an otherwise tonal look,” Beatrice says. 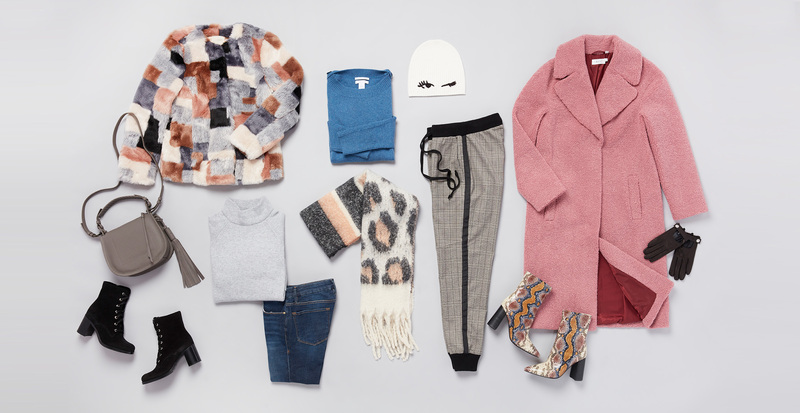 Our favorite way to wear colorful coats? With over-the-knee boots and a boldly patterned scarf. Jogger pants are like a form of socially-acceptable pajamas, only better. Because in addition to being comfortable and non-restrictive, they’re flattering and versatile. For a fashion-forward outfit, Beatrice suggests styling a trendy pair of patterned joggers with a cozy cashmere sweater and edgy lace-up booties. For days when extra layers are required, add a leather jacket and warm beanie. Bright colors. Bold patterns. Fun textures. We love this outfit because it really doesn’t hold back and successfully incorporates all of our favorite trends in one. The trick to pulling off this faux-fur jacket and printed boots combo? “Break up the look with classic pieces,” Beatrice says. For this look, the dark denim and a solid-colored cashmere sweater serve as anchors, balancing the entire outfit.